If you’ve ever wondered what automotive engineers do in their free time, what they dream about when they aren’t designing thoroughly researched products to appeal to the masses and appease the bean counters, or what they would build if turned loose with all of the resources a company like Lexus has to offer, wonder no more. The legend behind the Japanese company’s new M3 stalker is that it was conceptualized and largely executed by just two engineers working in their free time after hours. If you believe such automotive lore, then the IS-F has been bred from the same automotive passion that forged companies like Ferrari and Lotus, free from the upper managerial chains that drag so many great possibilities into the mire of mediocrity. This car is a laugh in the face of responsibility, and Lexus is seizing on the chance to prove that it is more than luxury cruisers and hybrid SUVs. The sports sedan comes with a cockpit that comfortably envelops both pilot and passengers. High bolsters, clear gauges and fine details dominate inside, while a near-flawless direct-shift 8-speed transmission delivers up shifts as fast as one-tenth of a second outside. The 5.0-liter V-8 produces thrills both from thrust and the sound of the exhaust. Massive rotors and calipers provide unbeatable stopping prowess. It looks pretty darn good too. Though the interior manages to keep occupants planted while you dance around the track, ingress and egress can be a bit of a challenge for everyday driving thanks to an incredibly low-slung seating position up front. The big V-8 provides plenty of thrust, but it is a heavy drinker with fuel economy of 16-mpg city and 23-mpg highway, not bad, but not that great either. From the moment you slide behind the wheel of the IS-F, you’re aware that there is something different about this car. Mash the throttle, and it quickly becomes clear what that difference is – abundant power. The V-8 delivers blinding speed, with enough power to push the hefty sedan to a 4.6-second 0-60 time. Straight lines are fast, but the IS-F dominates through the corners, staying firmly planted from apex to apex. The car forgives trespasses of drivers unfamiliar with 416 horsepower to the rear wheels thanks to the VDIM stability management system, which is capable of controlling any of the four brakes to help you maintain control. The effect is an uncomprehendingly simple to drive beast. In automatic mode, the transmission shifts briskly, though the 8-speed in manual mode delivers lightning-fast up shifts and devilishly quick rev-matched down shifts via steering wheel mounted paddle shifters. We think the IS-F really shines on the highway, where traffic falls by the wayside and its smooth power delivery never falters. The 5.0-liter all-aluminum V-8 under the IS-F’s hood is a marvel. While the maximum 416 horsepower is available at 6,600 rpm, just 200 rpm below red line, the power is consistent throughout the rev range. The 371 lb-ft of torque presses occupants even deeper into the seats at around 5,200 rpm. The 8-speed direct shift transmission with manual mode is a tad bit of overkill but somewhat awe inspiring in its intricacy. As much as we loathe to admit it, the IS-F’s automatic can shift faster, match revs better and deliver power to the pavement with the kind of precision we could only wish for. The IS-F is decked out with all kinds of innovative go-fast goodies. The VDIM stability control has three modes: Standard, Snow and Sport. In Standard mode, the traction control operates so smoothly that it’s almost impossible to tell that it’s engaging. An in cabin “beep-beep-beepâ€ lets you know when you’re pushing your limits – not the car’s. Massive 14.2-inch drilled Brembo rotors and six-piston calipers bring all 3,780 lbs of high-speed sedan to a halt. Aside from the cutting-edge stability management system, the IS-F is available with a 14-speaker 7.1 surround sound system and a DVD navigation system with backup camera for $4,590. While the sound system is just about as sweet as it gets, something tells us that if you’re driving this car, you don’t mind getting a little lost along the way. While the big V-8 has a larger displacement and produces more power than the BMW M3, it manages to get slightly better gas mileage. 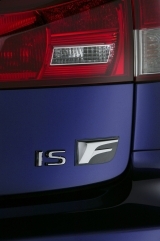 The IS-F gets 16 mpg city and 23 mpg highway thanks largely to the super-slick 8-speed transmission. Be prepared to see those figures drop if you plan to flog out all 416 horsepower. 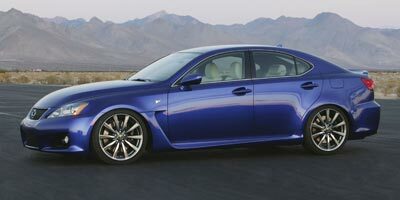 Though the IS-F’s performance is an about face for the company known for its luxury rides, the interior delivers all of the refinement that Lexus prides itself on. Supple leather, a clean dash and high bolstered seats are par for the course inside. Lexus’s new street fighter carries some family resemblance to the IS line with a smooth, rounded hood, but the car flexes its performance muscles through a few specific design elements. A brake vent up front dominates the side of the vehicle, and out back quad stacked exhaust pipes let the competition know exactly why they’re behind you. Competition is somewhat fierce in this neck of the woods, with the IS-F starting at an even $56,000. It’s clear the company had its sights set on one car in particular, the BMW M3 sedan at $53,800, though other German competitors include the Audi S5 at $51,800 and the Mercedes Benz C63 AMG at $53,800. The Audi S4 sedan could also be a potential match at $48,610, though the lower power numbers may be a slight disappointment. We’ll have to wait for the Cadillac CTS-V to compete in the segment later this year. The IS-F clearly has the goal of trying knocking BMW’s beloved M3 off its performance podium. Have they done it? Well… the car is an absolute blast to drive, and while purists will bemoan the lack of a manual transmission and complain that the VDIM separates the driver from the track at too great a degree, we say such is the advancement of the automotive world. F is for future.